Water damage can be caused by roof leaks, water heaters, toilets, showers, sinks, washers, and even pipes. Some of the most difficult and time consuming repairs can come from water damage due to drying time. Delaying these repairs can cause even more damage. Popcorn ceiling texture was very popular is the late 70’s and 80’s. Removing popcorn ceiling texture is a fairly simple process. Removing the dated material can increase property values and offers you a modern look. Do you want to finish a bonus room, add a wall, remove some wood paneling? When it comes to installing drywall on your remodel project, we can do just about anything. We can either remove your existing wallpaper or seal and float over. 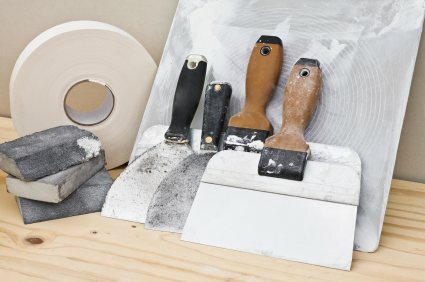 If you have already taken off your wallpaper and you could not get all of it off or you damaged the drywall, we can still seal and float the damage you caused. From light splatter texture, orange peel, knock down, stomps, old world, spray and custom hand trowel textures we will match all surfaces and restore them to their original look. We can paint after the drywall repairs are complete providing you have the matching paint onsite. If not, we can provide you a quote for painting the repairs or entire rooms.